Nonin 9843 Pulse Oximeter & CO2 Detector $969.00 - Digital Handheld Nonin 9843 Pulse Oximeter Portable Pulse Oximetry. Free Shipping. *±1 Arms encompasses approximately 68% of the population. Quality Systems are registered to ISO 13485. NOTE: For CO2 monitoring, the patient must be intubated or have an endotracheal tube. The Nonin 9843 combines proven pulse oximetry technology with reliable CO2 detection, making it an ideal monitor for patient transport and emergency use. The Nonin 9843 Pulse Oximeter/CO2 Detector provides "first breath" activation by eliminating any warm-up time – simply turn on the power and start taking measurements. Nonin’s patented semi-quantitative CO2 technology, combined with mainstream sampling, eliminates the need for calibration, thus reducing operating expenses. The Nonin 9843 sensor includes an airway adapter tube with a low 6 cc dead space and anti-fog coating for superior performance. 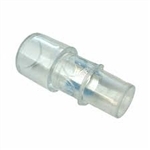 The single-user airway adapter tube eliminates cross-contamination and is compatible with pediatric through adult endotracheal tubes. An easy-to-interpret and highly visible LED bar graph is standard on all Nonin 9840 Series models. Proven — Used by patient transport and emergency professionals worldwide. Flexible — Choice of non-alarm, apnea alarm, or full-alarm models. “First Breath” Active — No warm-up required. Rugged — Drop and vibration tested. Easy-to-Use — Intuitive key pad. Cost-Effective — No calibration required.